Air-jellyfish wafting through a pink sunset. In any case, birds didn’t start out as light, thin, filmy creatures. They started out as small raptor-y dinosaurs. Natural selection acts only on the traits that are present: massive change to the shape of an organism is hard. (Not impossible! But comparatively rarer.) Birds started out with backbones, four limbs, a head, two eyes, etc., and they evolved flight from that initial morphology. But how do you make a dinosaur that can fly? Dinosaurs are strong, yes, but they are heavy. Bones are heavy; muscle is heavy; fat is heavy; teeth are heavy. Birds are light. They maintain minimal fat reserves, often storing little more than what they need to survive one day of fasting. Many of their bones are hollow and filled with struts, making them structurally strong but much less heavy than mammal or lizard bones. The skeletons themselves are minimalist: rib cage to protect organs, brain case to protect the brain, keel for flight muscle attachment – and everything else minimized. Skeleton of an unknown bird. Photo by howzey. 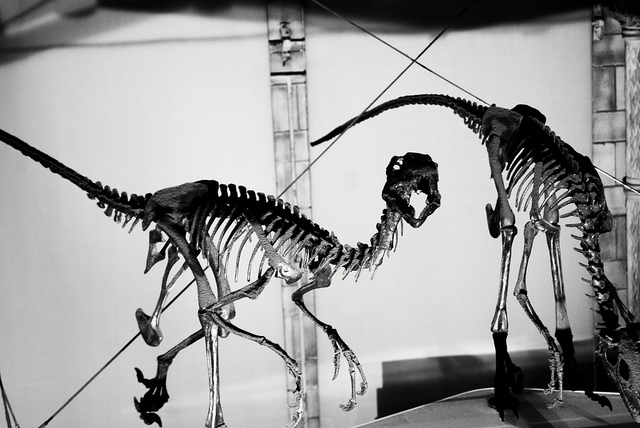 The dinosaur’s huge pelvic bone is tiny in the birds. The long tail is just a few little vertebrae. The many wrist and finger bones have been reduced and fused. The heavy tooth-filled jawbone is now a light beak. 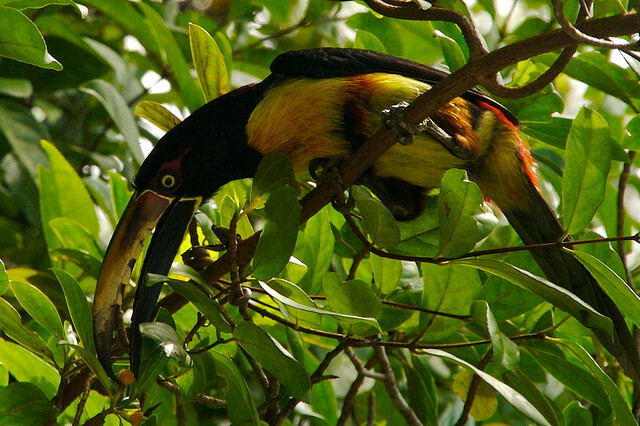 Toucan bills are hollow, so not as heavy as they look. Photo by Luca5. 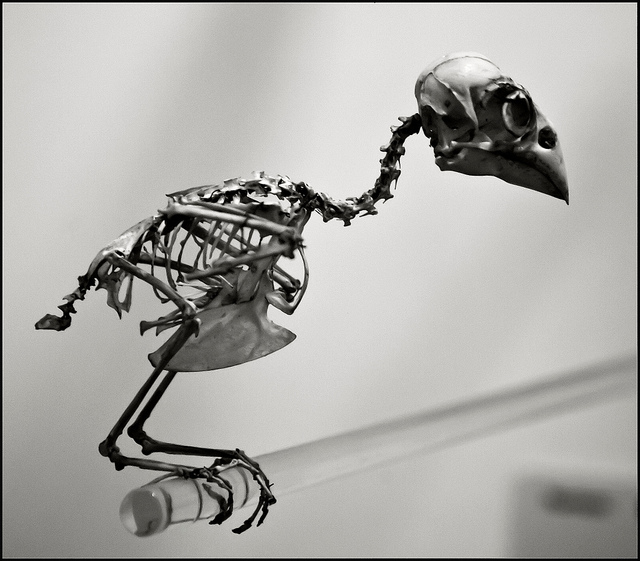 The basic components of that minimalist skeleton are similar in all flighted birds. 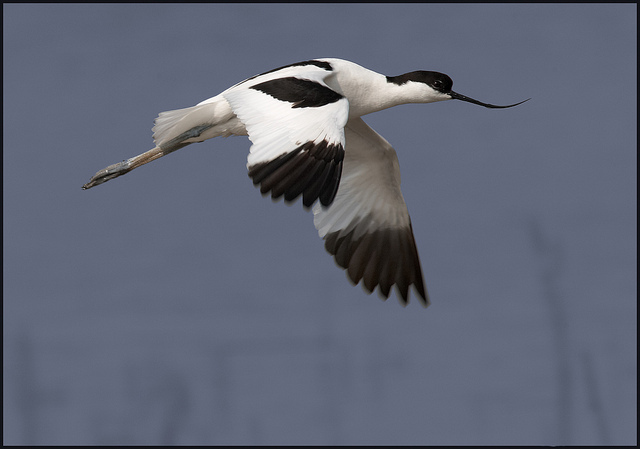 Sometimes the neck is longer or the bill wider, but it is always light. 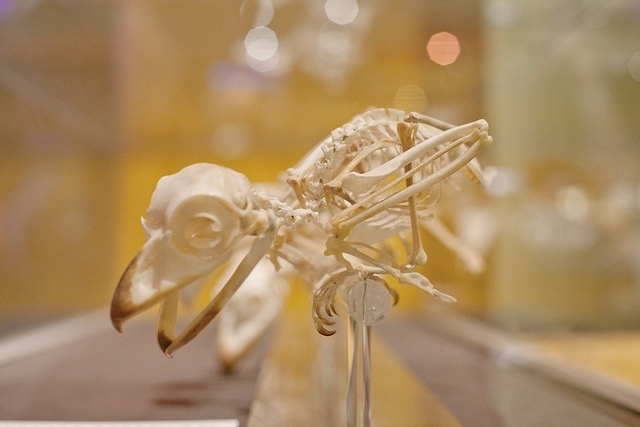 We know that this is flight-related, and not just because for some reason birds all have light skeletons, because we can look at flightless birds for comparison. 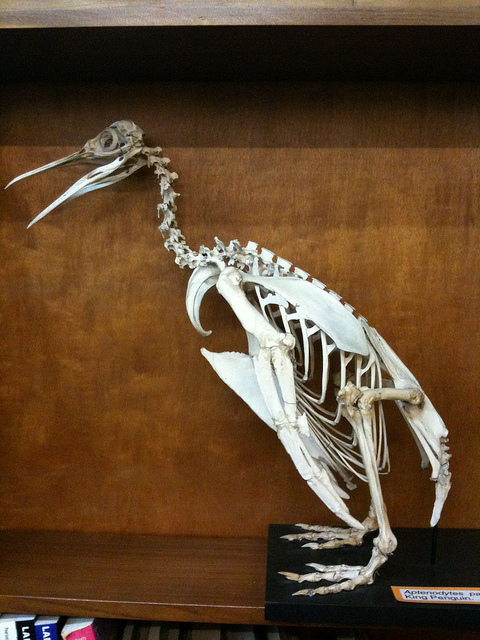 Flightless birds have heavier, more robust skeletons, since they don’t have to worry about achieving lift-off. To fly, birds must be both light and powerful. Muscle is heavy, but huge flight muscles (and the large keel on the breastbone where they attach) are worth their considerable weight. The largest flight muscle, the pectoralis complex, can account for up to 35% of a bird’s total weight. 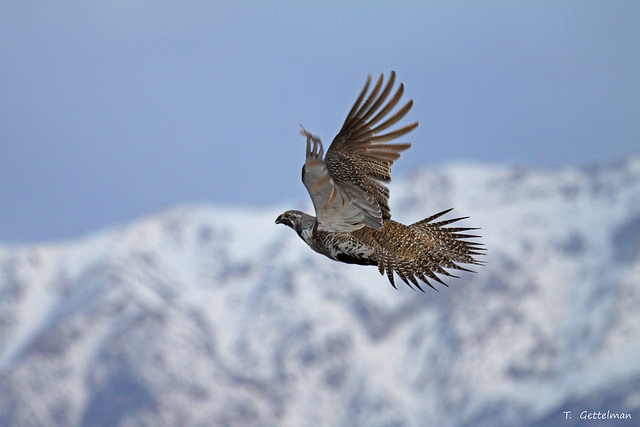 The flight muscles are the power behind birds’ flapping flight. If you have eaten chicken, turkey, or duck breast, you have eaten the pectoralis muscle. This muscle is light in color in chickens and turkeys (“white” as opposed to “dark meat”) because these birds fly only in short bursts, so their flight muscles are composed mainly of anaerobic white muscle fibers, which are good for sudden, explosive action. Birds which have to sustain flight for longer periods of time have more aerobic red muscle fibers in their flight muscles, and their flight muscles are redder in color. Birds are also great at breathing. 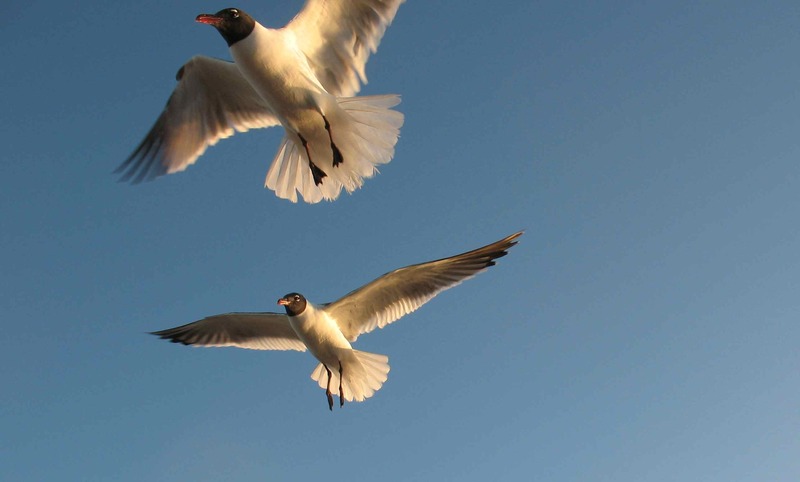 That sounds silly, but it’s true: birds have a more efficient respiratory system than we do. Our lungs are dead ends: we inhale, bringing new air into our lungs, then exhale, expelling air from our lungs. We get one lung-full of fresh air per breath. Birds, however, have air sacs in addition to lungs, and the configuration of air sacs and lungs allows the bird to fill its lungs with fresh air on both the inhalation and the exhalation. This helps the bird get enough oxygen to handle the exertion of flight. A bird’s wingbeats and its springy furcula (“wishbone”) help to pump air through its respiratory system, and the inflated air sacs help protect its internal organs. Finally, birds use feathers. Flight feathers are very light, being mostly air: the rachis (shaft) of the feather is hollow, and the barbs (the feathery part) are not solid, but are single strands covered in many hooks, allowing the barbs to zip together and behave as a flat plane. Birds’ lift surface is almost entirely composed of feathers on the wings and tail; building these surfaces out of feathers makes them light but strong. What with air-filled bones, air-filled air sacs, and air-filled feathers, birds are pretty much just muscular balloons. Reference: Gill, Frank B. 2007. Ornithology, 3rd ed. New York: W.H. Freeman & Company. 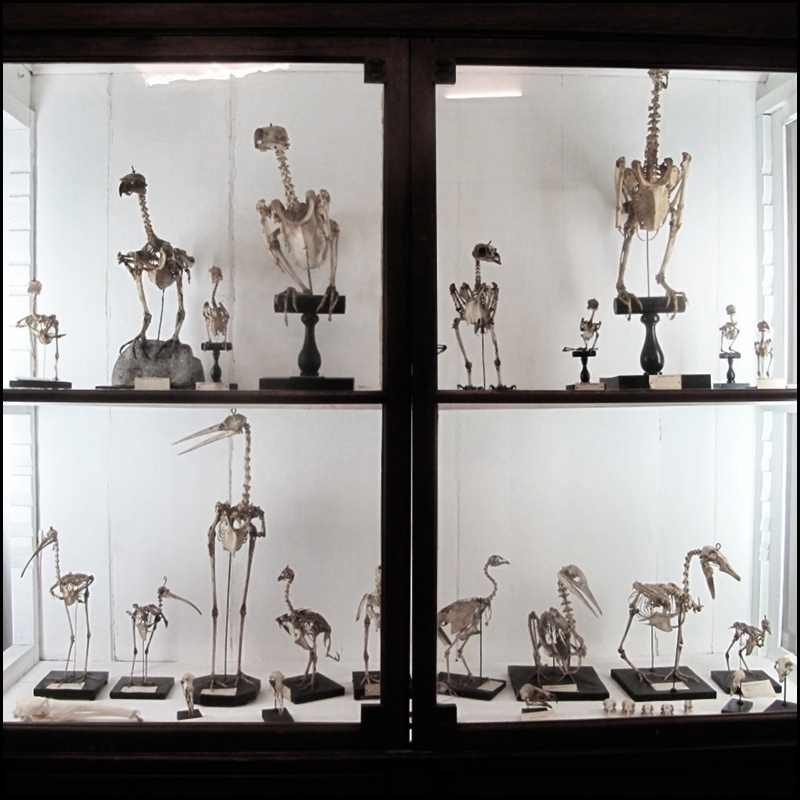 This entry was posted in avian flight, general science-y stuff and tagged biology, birds, dinosaurs, flight, morphology, science, skeletons by toughlittlebirds. Bookmark the permalink. some lovely bird shots and interesting stuff! Wow so interesting to see the skeletons of these birds! 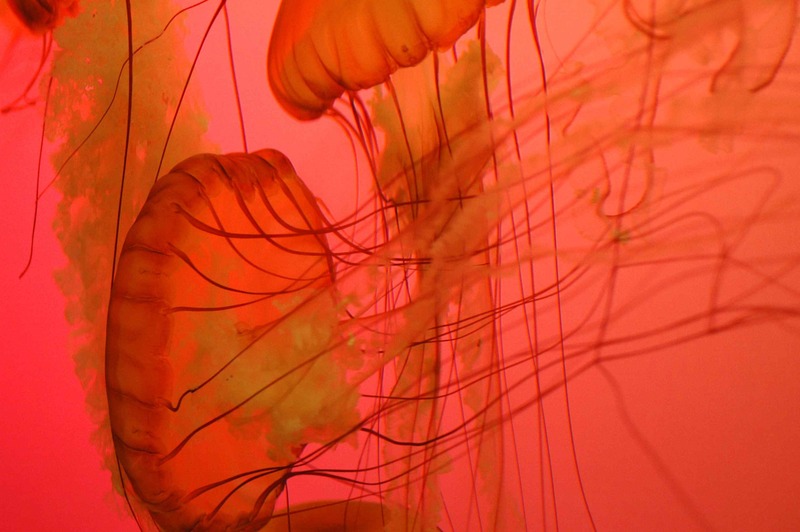 The jelly fish picture in itself is quite beautiful! I love the skeletons, I’m glad you liked them too! And thanks – for every one graceful jellyfish photo I have five where the tentacles are all askew and every which way, but this one was okay. What amazes me, too, is the range of size and weight. The Canada Geese who winter in Chicago leave large, heavy footprints in the snow; they may be light for their size, but they’re substantial. Yet they fly as easily as tiny songbirds.